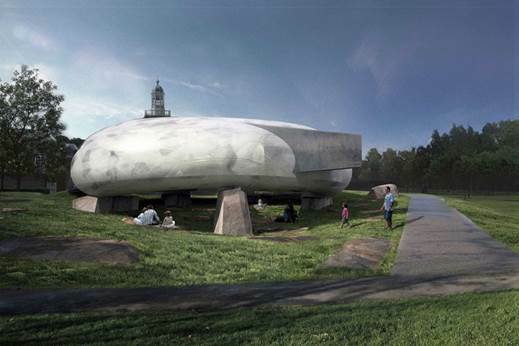 The Serpentine has commissioned Chilean architect Smiljan Radic to design the Serpentine Galleries Pavilion 2014. Radic is the fourteenth architect to accept the invitation to design a temporary Pavilion outside the entrance to the Serpentine Gallery in Kensington Gardens. The commission is one of the most anticipated events in the cultural calendar, and has become one of London’s leading summer attractions since launching in 2000. Smiljan Radic’s design follows Sou Fujimoto’s cloud-like structure, which was visited by almost 200,000 people in 2013 and was one of the most visited Pavilions to date. Previous Pavilions have been designed Herzog & de Meuron and Ai Weiwei, 2012; Peter Zumthor, 2011; Jean Nouvel, 2010; Kazuyo Sejima and Ryue Nishizawa, SANAA, 2009; Frank Gehry, 2008; Olafur Eliasson and Kjetil Thorsen, 2007; Rem Koolhaas and Cecil Balmond, with Arup, 2006; Álvaro Siza and Eduardo Souto de Moura with Cecil Balmond, Arup, 2005; MVRDV with Arup, 2004 (un-realised); Oscar Niemeyer, 2003; Toyo Ito and Cecil Balmond – with Arup, 2002; Daniel Libeskind with Arup, 2001; and Zaha Hadid, who designed the inaugural Pavillion in 2000. 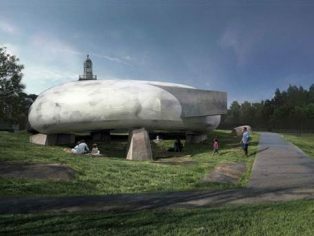 Occupying a footprint of some 350 square metres on the lawn of the Serpentine Gallery, plans depict a semi-translucent, cylindrical structure, designed to resemble a shell, resting on large quarry stones. Radic’s Pavilion has its roots in his earlier work, particularly The Castle of the Selfish Giant, inspired by the Oscar Wilde story, and the Restaurant Mestizo, part of which is supported by large boulders. Design as a flexible, multi-purpose social space with a café sited inside, the Pavilion will entice visitors to enter and interact with it in different ways throughout its four-month tenure in the Park. On selected Friday nights, between July and September, the Pavilion will become the stage for the Serpentine’s Park Nights series, sponsored by COS: eight site-specific events bring together art, poetry, music, film, literature and theory and include three new commissions by emerging artists Lina Lapelyte, Hannah Perry and Heather Phillipson. Serpentine Pavilion 2014 launches during the London Festival of Architecture 2014. Smiljan Radic has completed the majority of his structures in Chile. His commissions range from public buildings, such as the Civic Neighbourhoods, Concepción, Museo Chileno de Arte Precolombino, Santiago, Restaurant Mestizo, Santiago, and the Vik Winery, Millahue, and domestic buildings, such as Copper House 2, Talca, Pite House, Papudo, and the House for the Poem of the Right Angle, Vilches, to small and seemingly fragile buildings, such as the Extension to Charcoal Burner’s House, Santa Rosa, The Wardrobe and the Mattress, Tokyo, Japan, and The Bus Stop Commission, Kumbranch, Austria. Considerate of social conditions, environments and materials, Smiljan Radic moves freely across boundaries with his work, avoiding any specific categorisation within one field of architecture. This versatility enables him to respond to the demands of each setting, whether spatial constraints of an urban site or extreme challenges presented by a remote rural setting, mountainous terrain or the rocky coastline of his native Chile. AECOM will again provide engineering and technical design services, as it did for the first time in 2013. In addition, AECOM will also be acting as cost and project manager for the 2014 Pavilion. While this is the second Serpentine Pavilion for AECOM, its global chief executive for building engineering, David Glover, has worked on the designs for a majority of the Pavilions to date. The Serpentine is delighted that J.P. Morgan Private Bank is the co-headline sponsor of this year’s Pavilion.